Wine, palace-like manor houses and antique shops: this is how beautiful Borba could be described. And this is why Rita and João Cavaleiro Ferreira decided to open the Terreiros 13, 15, one of the most well-known antique shops in famous Rua dos Antiquários (Antique Shops Street), and also to recover Casa do Terreiro do Poço, an important piece of the local heritage. Referred in the Portuguese Artistic Inventory for its mural paintings and frescoes, the house has three main bodies which are connected by staircases and balconies. 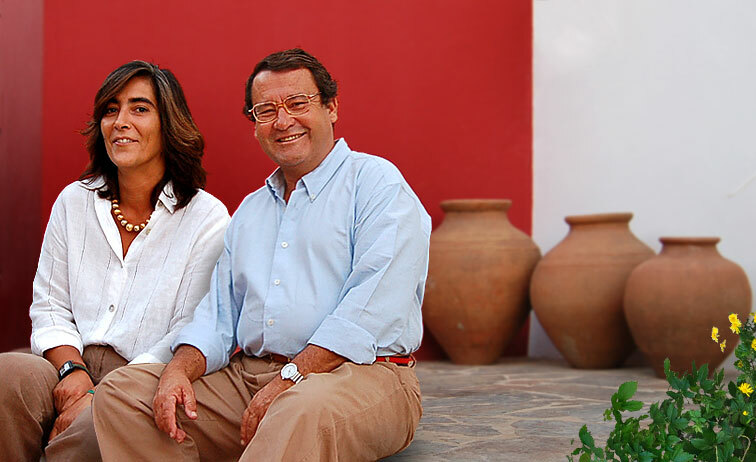 With about 30 divisions, it is easy to understand why Rita and João are so glad to invite you to come, share a glass of excellent Borba wine and enjoy the mild temperature of a quiet Alentejo's nightfall. Room also available for 2 pax only. Contact the owner by e-mail. 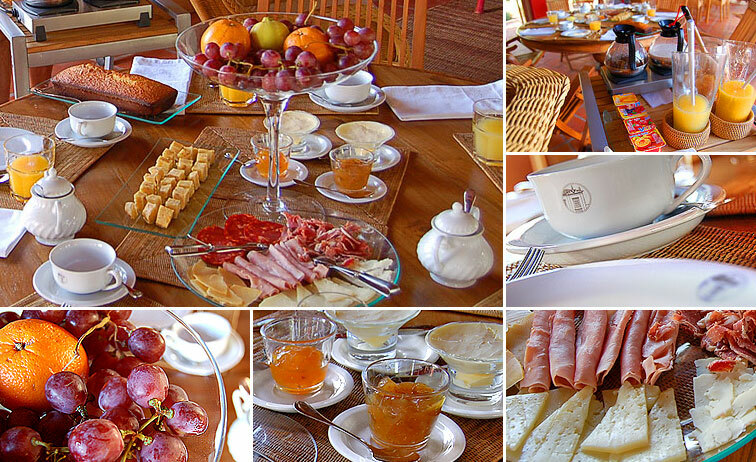 Breakfast is served in the old wine cellar with vaulted ceiling, between 9am and 11am. However, this schedule is not strict and, if guests want so, breakfast can also be served in the bedroom, with the payment of an extra fee. Rita and João will be happy to organize a meals service for their guests, if booked in advance. The catering is from a local restaurant. 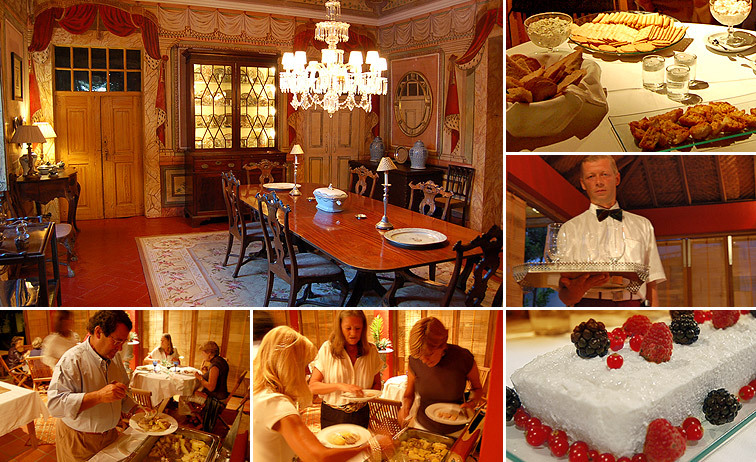 You can even ask for a ceremonial dinner, with a dining room, a waiter in a uniform and an according service. This area provides support to small group events like local production goods - cheeses, sausages and wine - tastings, as well as cooking workshops and pastries. 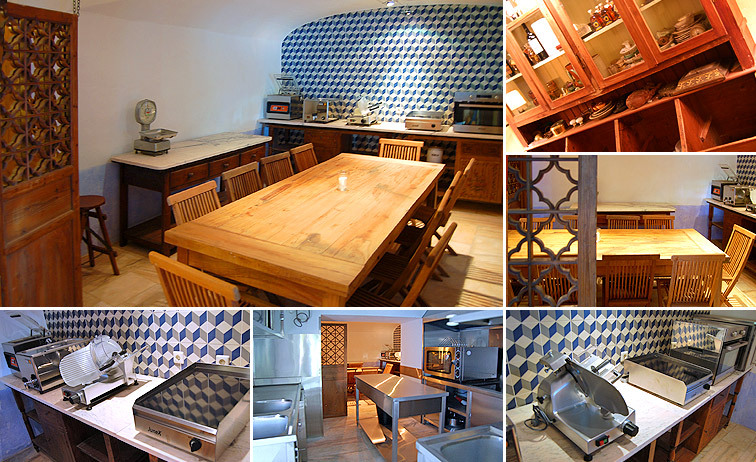 The area consists of a room with a large table, supported by a professional oriented cuisine. Depending on the size of the group, the the old wine cellar with vaulted ceiling and two huge linked tables may also be used. 1. The swimming pool and its supporting pavilion (2.) are the central nucleus of activities, especially by the well-being and peacefulness they provide. In the summer, with its doors opened, the pavilion provides a pleasant breeze. When it is cold, closed, it becomes a comfortable living room. 3. For those who rather have some activity instead of the dolce far niente, there are bicycles at disposal so they can ride through Borba. 4. Also, the repair shop of Rita’s antique store works on a garden’s pavilion, allowing guests to participate in its activities through workshops promoted by the owners. 5. Borba is a village with centenary traditions in dealing with antiques and old things. Therefore, you must visit the famous Rua dos Antiquários, a true “mall” of antiques. 1. Beyond its cheeses and wines, Borba is known for its heritage. The wealth provided by the wine production of the 18th and 19th centuries justifies the town’s beautiful architectonic style, enriched by the beautiful marbles of the region. 2. At the Adega Cooperativa’s wine shop, taste and buy the elegant nectars produced from the vineyards (3.) that spread through the region’s undulating landscape. 4. 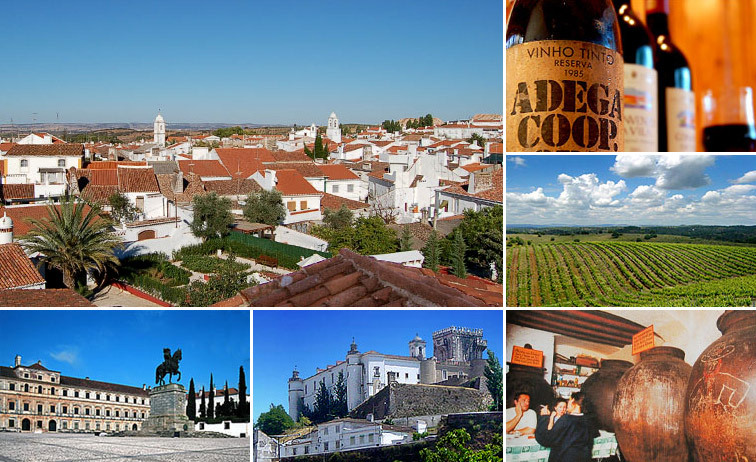 Vila Viçosa, one of the jewels of Alentejo, it’s only a few miles away. Its superb architectonic heritage has its best example in the Renaissance façade of the Ducal Palace. 5. 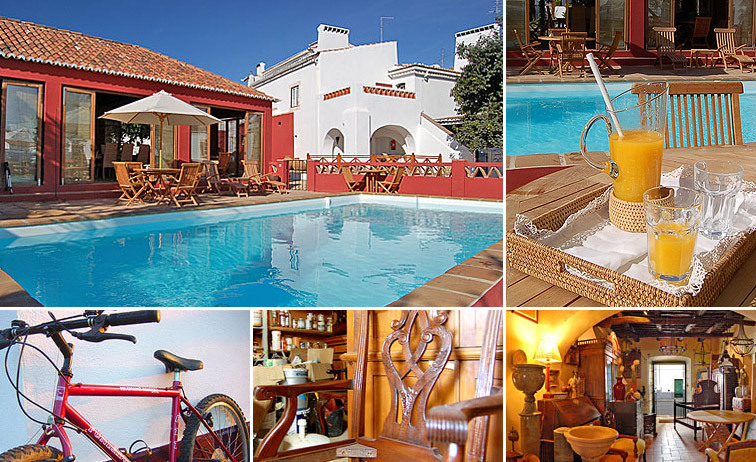 Don’t miss also historical Estremoz, surrounded by defensive walls and dominated by the keep. On Saturdays, enjoy the cultural diversity of the local rustic market and have lunch (6.) in a typical restaurant. Don’t forget to ask João’s advice for the best places to eat. 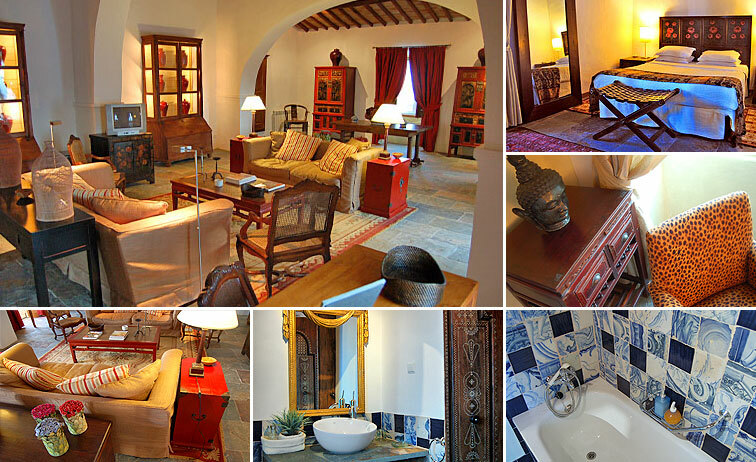 We'd love to share it with you..."
Did you like Casa Terreiro do Poço? Visit wonderfulland.com and discover other well kept secrets in Portugal.